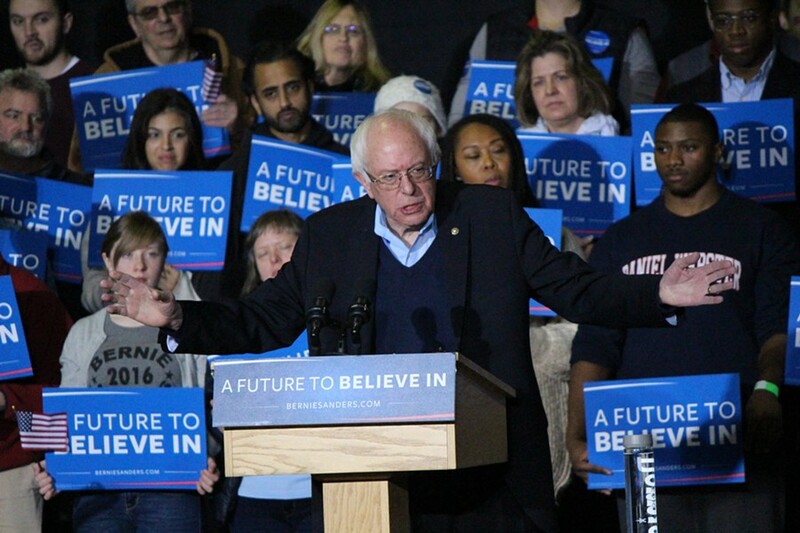 Sen. Bernie Sanders speaks Monday at Daniel Webster College in Nashua, N.H. Updated at 5:47 p.m. with a new statement from Sanders campaign manager Jeff Weaver. Sen. Bernie Sanders (I-Vt.) turned the other cheek Monday to a series of tough attacks launched against him over the weekend by top allies of Democratic presidential rival Hillary Clinton. Speaking Monday morning at a college in Nashua, N.H., and later that day at a Manchester theater, Sanders never once uttered Clinton's name. His spokesman, Michael Briggs, indicated that the candidate did not plan to respond. "It's disappointing, but we're going to try to stick to the message that he's been talking about, that's been resonating all over the country," Briggs said during the earlier event, which was staged in a gymnasium at Daniel Webster College. During a speech Sunday afternoon in Milford, N.H., former president Bill Clinton unleashed what the New York Times called a "stinging attack" and what Politico called "a brutal litany of attacks" against Sanders. Bill Clinton criticized everything from the Vermonter's single-payer health care plan to his participation in elite fundraising events to his campaign's breach of Clinton campaign voter data. He even took a jab at Sanders' online supporters, who he accused of engaging in "vicious trolling and attacks that are literally too profane often — not to mention sexist — to repeat." Earlier in the weekend, former secretary of state Madeleine Albright and feminist icon Gloria Steinem both criticized young women who back Sanders over Clinton. "There is a special place in hell for women who don't support each other," Albright said, repeating a phrase she has used often in the past. In an interview Sunday with NBC's Kate Snow, Sanders called Albright's comment "an unfortunate statement." "I think women should help women and women should help men," he said. The Clinton campaign's attacks came as Sanders continued to lead his Democratic rival in New Hampshire polls by 10 to 20 percentage points. The Granite State holds its first-in-the-nation primary on Tuesday. Later Monday, Sanders campaign manager Jeff Weaver issued a scathing statement criticizing the Clinton camp for its tactics. “It is very disturbing that, as the Clinton campaign struggles through Iowa and New Hampshire, they have become increasingly negative and dishonest,” Weaver said, citing a host of recent allegations he said were untrue. Weaver focused his ire on a new charge the Clinton campaign has made in recent days: that during his 2006 Senate race, Sanders benefited from $200,000 worth of spending by the Democratic Senatorial Campaign Committee. Citing a recent CNN report, the Clinton campaign noted that Sanders had also raised money for the DSCC at lavish retreats on Martha’s Vineyard and in Palm Beach, Florida. The candidate herself cited the story Monday in Manchester, according to multiple media reports, in an effort to counter Sanders’ frequent allusions to her Wall Street fundraising. In his statement later Monday, Weaver challenged the logic of Clinton’s comment. Weaver concluded his statement by alluding to a Politico story forecasting a Clinton campaign staff shakeup.